French Nazi collaborator Angelo Chiappe was shot on this day in 1945. A right-wing legislator and adherent of the fascist Action Francaise movement before the war, Chiappe copped an appointment as the Vichy prefect of the Gard department. There he made himself hateful to the war’s eventual winners by his enthusiasm for hunting French Resistance members, communists, and Jews for forced labor and deportation and worse. Captured in August 1944, he was shot January 23, 1945 before the gorgeous Roman arena of Nimes. 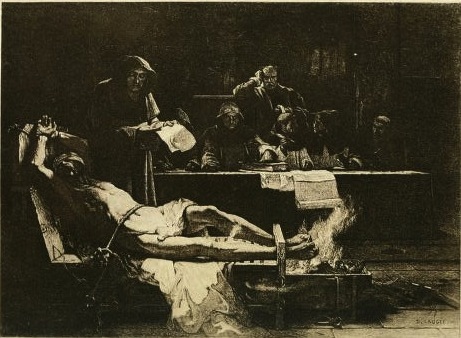 On this date in 1704, the great Camisard commander Pierre Laporte was publicly burned. He was already two days dead, but the same could not be said by five comrades-in-rebellion who were quite alive as they were broken on the wheel. Familiarly known by the nom de guerre “Roland”, Laporte (English Wikipedia entry | the far more detailed French) was a whelp of 22 when entrusted with command of about 400 Protestant guerrillas operating around Lassalle, and his native Mialet. These were rebels in a very dirty regional civil war in France’s heavily Protestant southeast, following the crown’s revocation of tolerance for the heretics. Roland proved himself one of its ablest prosecutors, putting Catholics to fire and sword be they enemy troops or wrongthinking neighbors. By 1704 the insurgency was circling the drain as Camisard officers were either killed off or bought off. Our self-proclaimed “general of the children of god” was not the type to be had for 30 pieces of silver plus an army commission,* and so only violence would do for him. 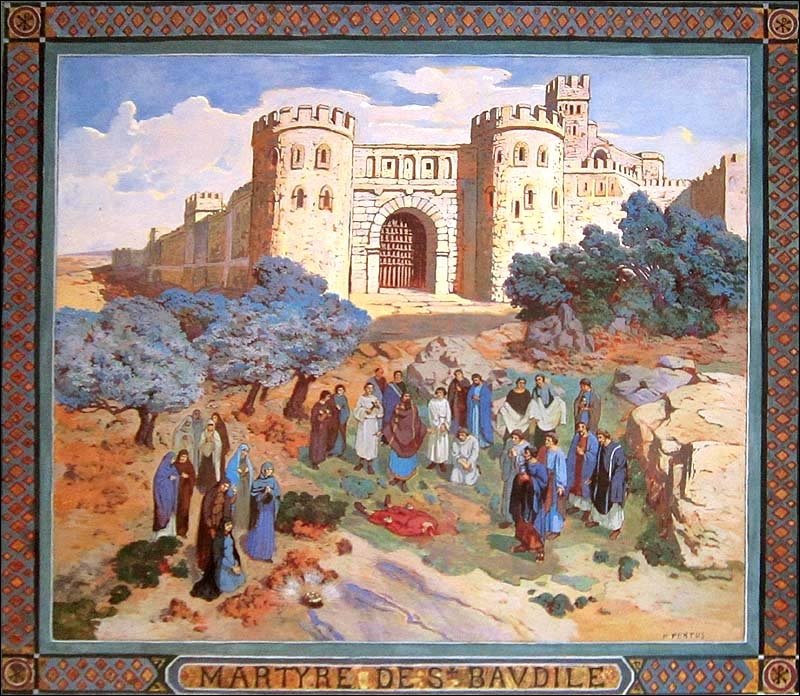 On August 14, betrayed by an informer who was amenable to purchase, Roland was slain in a Catholic ambush at Castelnau-les-Valence. Five officers escorting him opted not to go down fighting and surrendered instead, which proved a regrettable decision. For the unusually interested reader, there’s a 1954 French biography by Henri Bosc — who also authored a multi-volume history of the Camisard war — titled Un Grand Chef Camisard Pierre Laporte dit Roland, 1680-1704. It’s long out of print and appears to be difficult to come by. * Not long before Roland’s defeat, just such a deal had shockingly induced fellow Camisard commander Jean Cavalier to turn coat. 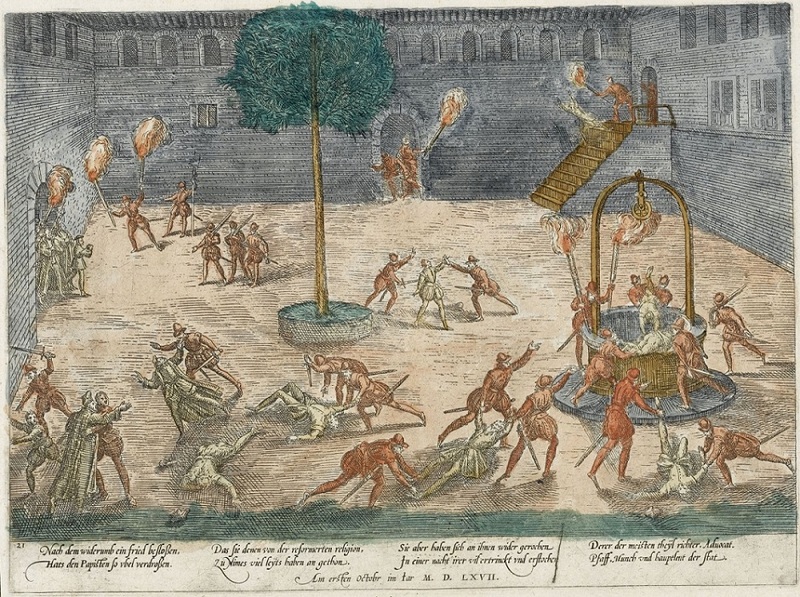 On this date in 1705, two men were burned at the stake and two others broken on the wheel — Camisards all, put to death in Nimes, France. The Camisards* were French Protestants of the mountainous southern Cevennes region who make their entry into these pages because the crown in 1685 revoked the Edict of Nantes, France’s guarantee of multiconfessional toleration. In 1702, the Cevennes Protestants pushed back. 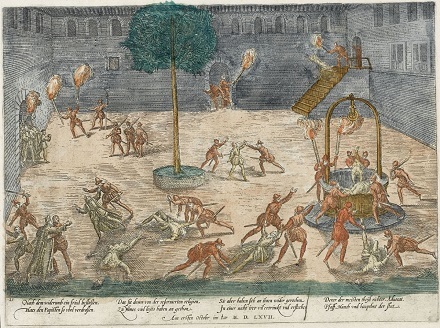 On July 24, 1702, the Catholic torturer-priest running this show was assassinated, and the Camisard revolt was on. Two years of dirty neighbor-on-neighbor violence mostly petered out in 1704 with the loss of the Camisards’ two main leaders — Jean Cavalier, the brilliant peasant-turned-commander who was bought off by an army commission and a royal pension, and Roland Laporte, who was betrayed as by Judas for 200 pieces of gold. 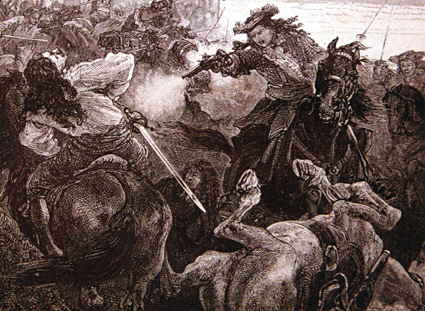 Catinat and Ravanel were Cavalier’s lieutenants; according to Alexandre Dumas, Catinat was a peasant named Abdias Maurel who picked up his nickname after serving under Marshal Catinat in the War of Spanish Succession. The prospect of a renewed rising drew them back — a bold and terrible stroke to mount a surprise massacre and kidnap the exiled English Duke of Berwick. Catinat returned from his hidey-hole in Geneva; Ravanel came the bush where he was the last notable Camisard commander in the field. An informer spilled the secret and the conspirators were busted in Nimes before they could spring their trap. They faced immediate trial and condemnation — Catinat and Ravanel, along with two younger fighters named Jonquet and Villas. The next day, the 22nd April, 1705, they were taken from the prison and drawn to the place of execution in two carts, being unable to walk, on account of the severe torture to which they had been subjected, and which had crushed the bones of their legs. A single pile of wood had been prepared for Catinat and Ravanel, who were to be burnt together; they were in one cart, and Villas and Jonquet, for whom two wheels had been prepared, were in the other. The first operation was to bind Catinat and Ravanel back to back to the same stake, care being taken to place Catinat with his face to windward, so that his agony might last longer, and then the pile was lit under Ravanel. As had been foreseen, this precaution gave great pleasure to those people who took delight in witnessing executions. The wind being rather high, blew the flames away from Catinat, so that at first the fire burnt his legs only — a circumstance which, the author of the History of the Camisards tells us, aroused Catinat’s impatience. Ravanel, however, bore everything to the end with the greatest heroism, only pausing in his singing to address words of encouragement to his companion in suffering, whom he could not see, but whose groans and curses he could hear; he would then return to his psalms, which he continued to sing until his voice was stifled in the flames. Just as he expired, Jonquet was removed from the wheel, and carried, his broken limbs dangling, to the burning pile, on which he was thrown. From the midst of the flames his voice was heard saying, “Courage, Catinat; we shall soon meet in heaven.” A few moments later, the stake, being burnt through at the base, broke, and Catinat falling into the flames, was quickly suffocated. That this accident had not been forseen and prevented by proper precautions caused great displeasure to spectators who found that the three-quarter of an hour which the spectacle had lasted was much too brief a time. Villas lived three hours longer on his wheel, and expired without having uttered a single complaint. A hecatomb of Camisard executions followed, fed by the denunciations of frightened or avaricious people; still others were “merely” condemned to the galleys … bringing at last a sullen peace of arms to the turbulent province. * Here’s a 19th century public domain novel about the whole Camisard business. ** While three bore the torture quietly, Villas coughed up the name Boeton de Saint-Laurent-d’Aigozre. This man, too, was arrested and executed.